The 16th century Kabbalist, Rabbi Isaac Ben Solomon Luria revolutionized the study of Jewish mysticism through Kabbalah. He had the gift to explore the innermost depths of the Zohar. His disciple Rabbi Chaim Vital wrote down his teachings which have come to be known as Lurianic Kabbalah. Rabbi Isaac Luria (1534 – July 25, 1572) was a Jewish mystic in Safed. His name today is attached to all of the mystic thought in the town of Safed in 16th century Ottoman Palestine. While his direct literary contribution to the Kabbalistic school of Safed was extremely minute (he only wrote a few poems), his fame led to the school and all its works being named after him. The main popularizer of his ideas was Rabbi Hayim Vital, who claimed to be the official interpreter of the Lurianic system, though this was disputed by some. In Hebrew he is called Yitzhak Lurya יִצְחַק לוּרְיָא, Yitzhak Ben Shlomo Ashkenazi, and Yitzhak Ashkenazi. He is also known as Ari אֲרִי and Ha-Ari ("The lion") from the acronym for Elohi Rabbi Itzhak ("The Divine Rabbi Yitzhak"), thus Arizal with "ZaL" being the acronym for Zikhrono Livrakha ("of blessed memory" or literally "let the memory of him be for a blessing"), a common Jewish honorific for the deceased, and known as Ari Ha-Kadosh ("The holy lion"). 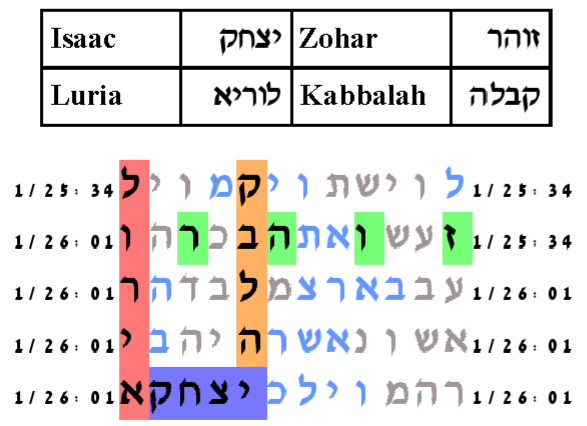 In this table we take his name, Isaac Luria, and pair it with Zohar and Kabbalah. The probabiilty that a table as compact as this would arise in the ELS random placement monkey text population is 9.5/100,000. The expected number of ELSs is set to 50. The cylinder has 16 columns. The probabiilty that a table as compact as this would arise in the ELS random placement monkey text population is 9.5/100,000.